Subconjunctival hemorrhaging occurs when a blood vessel in the eye ruptures and is a common occurrence in newborns that have been through prolonged labor and procedures such as forceps and vacuum assisted delivery. Known commonly as red eye, this is one of the most common birth injuries and usually carries a positive prognosis with proper care and monitoring. On occasion, failure to diagnose subconjunctival hemorrhaging can result in permanent impairment to the child’s vision if the eye becomes infected or the cause of the red eye is an undiagnosed infection. Rosenfeld Injury Lawyers LLC’ birth injury lawyers represent families throughout Illinois whose children have been harmed during or following birth due to medical malpractice. A lot of pressure is applied to a newborn’s head and face during delivery and this pressure is amplified if prolonged labor requires the use of forceps or a vacuum to assist the delivery. This pressure can cause a number of injuries to the head, face and skull— most of which involve ruptured blood vessels and swelling. Subconjunctival hemorrhaging can be caused by any of the following. If the child’s red eye was the result of improper or negligent use of delivery instruments, the attending staff may be liable for any complications that arise due to the initial injuries. The majority of red eye cases that cause long term harm are undiagnosed and this failure to diagnose and treat red eye can be classified as medical malpractice and a failure to meet the duty of care. Untreated subconjunctival hemorrhaging can have lasting effects on the child. 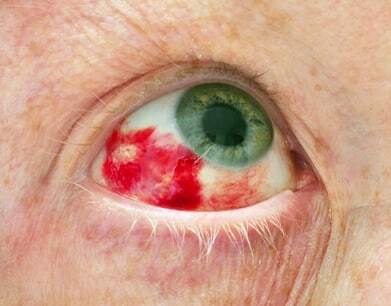 If the red eye is caused by an infection, the infection can spread, often leading to more serious conditions. Hemorrhaging caused by trauma may become infected and pose the same risks if untreated and all cases of red eye that go unnoticed can cause permanent harm to the child’s vision. All of these birth injuries are preventable and medical professionals who fail to provide adequate care should be accountable for their actions. If your child was injured during birth and you believe that his or her injuries could have been prevented, contact Rosenfeld Injury Lawyers LLC today to schedule a free consultation. Our offices are located throughout Illinois and if you are not close to one of our locations, we can travel to meet you. During your consultation, a birth injury attorney will review the details of your case, address your concerns and guide you through the process of litigation so that you know your rights and what to expect moving forward. If for any reason we are unable to win or settle your case, our services will be free of charge.